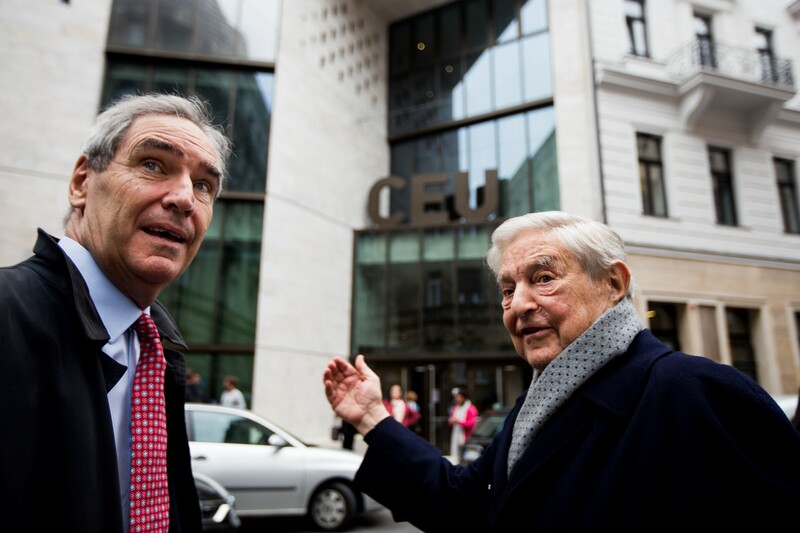 George Soros (R) with Central European University President Michael Ignatieff (L). The European People’s Party (EPP) has initiated a process that could remove Hungary’s governing Fidesz from the centre-right group. Twelve EPP parties requested this step, which will be voted on next week. “Viktor Orbán has crossed the red line,” said EPP President Joseph Daul. The final straw was not another one of the Hungarian government’s attacks on freedom of the press or labour rights. The uproar was caused by a poster aimed at a senior EPP politician. In February, Mr Orbán’s government unveiled a new campaign featuring adverts bearing the caption “You have a right to know what Brussels is preparing” featuring European Commission President — and EPP member — Jean-Claude Juncker and billionaire philanthropist George Soros. The campaign accuses Mr Juncker of pushing Mr Soros’ alleged pro-immigration plan. This was not the first time that George Soros was attacked by the Hungarian government. Ever since the 2015 refugee crisis, the Hungarian government has accused him of attempting to “Islamise” and “de-Christianise” Europe. Government-funded anti-Soros billboards have regularly popped up in cities and in villages all across the country. Advertisements with dramatic music and threatening messages have been aired on television and radio and printed in newspapers. In 2018, the government targeted the Central European University in Budapest, which was founded by Mr Soros, and also introduced the “Stop Soros” law that has made the work of human rights NGOs more difficult. Mr Soros, a Hungarian Jew born in 1930, survived the Nazi occupation and moved first to the United Kingdom and then to the US. He made a fortune as a hedge fund manager. But right-wing populists like Mr Orbán don’t attack him for his financial speculation, but for his philanthropic work. Mr Soros’ Open Society Foundation, which works towards “vibrant and tolerant democracies whose governments are accountable and open to the participation of all people”, support human rights organisations in more than 100 countries. The philanthropist is the perfect enemy. He’s liberal, rich — and Jewish. Mr Orbán is, of course, aware that open expressions of antisemitism are not tolerated in post-Holocaust Europe. At the same time, prejudices against Jews, which have been part of Europe for centuries, haven’t disappeared. According to the Anti-Defamation League’s latest published global survey, around 40% of Hungarians hold anti-Semitic views. That’s why the Hungarian government turned to dog-whistle politics. Hence, the analogy of a dog whistle, whose ultrasonic whistling sound is heard by dogs but not by humans. Dog-whistle politics uses antisemitic and racist code words which empower anti-Semites and racists but might be overheard by those who aren’t familiar with these resentments and conspiracy theories. “This is not about George Soros’ origins and identity”, said Fidesz MP János Lázár dismissing the accusations of antisemitism. Mr Lázár and other apologists for the Hungarian government’s anti-Soros campaigns are right that the posters don’t convey openly antisemitic messages. But that’s exactly the point of using dog whistle techniques: they employ coded words instead of explicit slurs. We can see examples of dog-whistle politics in the poster’s depiction of the philanthropist as the old-school grinning Jew, typical, for example, in 1930s Nazi propaganda posters. Unsurprisingly, András Heisler, head of the Federation of Hungarian Jewish Communities warned that this campaign might resonate with antisemitic feelings and that the posters resemble “bad times”. The governmental narratives surrounding Mr Soros use not only anti-Jewish imagery but other elements of classical antisemitism. By presenting Mr Soros as the “mastermind” behind Europe’s political elite, the long-established anti-Semitic topos of the Jew as the puppet master of politicians is reproduced. In these attacks, the canard of “Judeo-Bolshevism” plays a role as well: blaming Mr Soros for trying to “de-Christianise” Europe is very much in accordance with this bigoted fabrication according to which Jews are left-wing and intent on destroying Christian and traditional values. In addition to mining these stereotypes, these depictions of Mr Soros are consistent with Islamophobic narratives when they state that refugees would “Islamise” and take over the West. But this is so much more than just a Hungarian story. These anti-Semitic beliefs are highly influential throughout Europe and the Western world. Liviu Dragnea, the leader of Romania’s ruling Social Democratic party claimed that Mr Soros “financed evil” and implied that the Jewish financier tried to kill him. In Poland, Jarosław Kaczyński, leader of the governing right-wing Law and Justice Party, accused Soros’ organisations of advocating “societies without identity” which can easily be “manipulated by billionaires”. Austrian Vice-Chancellor Hans-Christian Strache even referred to the Soros-backed Central European University — which eventually left Budapest and moved its campus to Vienna — as a “wandering university”, repurposing the anti-Semitic trope of the “wandering Jew”. Mr Strache’s fellow Freedom Party (FPÖ) member, Viennese politician Johannes Gudemus followed suit, accusing Mr Soros of being responsible for mass migration to Europe. Anti-Soros conspiracy theories are getting more and more popular in countries outside of the European Union, most notably in the United States. Far-right news outlet Breitbart has often claimed that Mr Soros paid anti-Trump protesters, and former Fox News host Glenn Beck called Soros “a puppet master who holds the strings of the world in his hands”. Republican House Minority Leader Kevin McCarthy tweeted that Mr Soros tried to buy the 2018 midterm elections, and National Rifle Association Vice-President Wayne LaPierre accused Mr Soros of a socialist takeover. The Pittsburgh synagogue shooter also posted that George Soros was controlling the masses and that he was behind the so-called migrant caravan, a group of about 4,000 people heading on foot from Honduras to the US-Mexico border. The attacks on the Tree of Life synagogue — the deadliest antisemitic attack ever on American soil — reveal just how dangerous dog whistle politics can be. To calm the EPP, Orbán’s party announced that they will replace Juncker on their campaign posters with Frans Timmermans, the lead candidate of the Party of European Socialists for President of the European Commission in the 2019 European elections. But such a modification shouldn’t mollify the EPP. So far, Mr Orbán’s position in Europe has been strengthened by being a member of the same alliance as the continent’s most influential parties such as Angela Merkel’s Christian Democratic Union (CDU), in Germany. By expelling Fidesz, the EPP could send a clear sign: Antisemitism, racism, and the degradation of civil liberties have no place in the European Union. Armin Langer is a freelance journalist and a PhD student in sociology based in Berlin. He is the author of Ein Jude in Neukölln — Mein Weg zum Miteinander der Religionen and editor of the anthology Fremdgemacht & Reorientiert — jüdisch-muslimische Verflechtungen. For more information, please visit: arminlanger.net. Photograph courtesy of CEU / Tuba Zoltan (Kepszerkesztoseg). Published under a Creative Commons license.